These are just a few words of celebration that echoed through the hallways and classrooms of Kittredge Magnet School on Friday, December 21, 2018. They came from every student, staff member and administrator, and rang with an exceptional amount of truth for good reason: Kittredge was officially celebrating being named a National Blue Ribbon School—its third Blue Ribbon distinction in school history. The DeKalb County School District (DCSD) school is one of approximately 300 out of more than 8,500 nationwide to be named a 2018 National Blue Ribbon School. 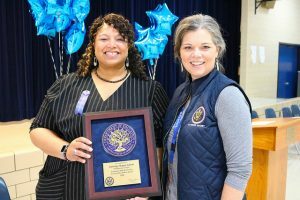 Kittredge joins Austin Elementary in being recognized for academic excellence as well as closing achievement gaps in economic and social subgroups by the United States Department of Education. Every year, schools who rank in the top 15 percent in their respective states are chosen by a Blue Ribbon committee. Kittredge was chosen not just in 2018, but also in 2004 and 2012. Neely joined Region 1 Superintendent Sherry Johnson as well as students and staff in a schoolwide celebration that ended with every student being served Blue Bell Ice Cream. King credited Kittredge students for not just being smart and high achieving, but also kind, caring, and open to one another. 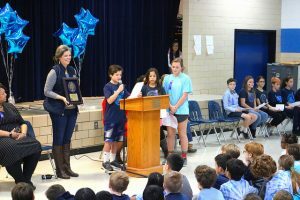 A group of exemplary sixth grade students also read Kittredge’s official congratulatory letter from United States Secretary of Education Betsy DeVos, while others read a congratulatory letter from Georgia Gov. Nathan Deal and DCSD CEO/Superintendent Dr. R. Stephen Green.